BACKGROUND AND PURPOSE: Steroid periradicular infiltration is a common nonsurgical sciatic pain treatment of inconsistent efficacy. The purpose of this study was to identify factors for predicting the efficacy or failure of this procedure. METHODS: Two hundred twenty-nine patients with lumbar radiculopathy were prospectively followed up at 2 weeks and 1 year after percutaneous periradicular steroid infiltration. The intensity of radicular pain was scored on the visual analog scale (VAS). Pain relief was classified as “excellent” when the pain was completely resolved or had diminished by 75% or more, “good” for a diminution of 50% to 74%, “fair” for a diminution of 25% to 49%, or “poor” for a diminution of less than 25% or an increase in pain. RESULTS: The mean VAS scores were 6.5 (range, 3.1–9.5) before and 4.2 (range, 0–9.5) 2 weeks after the procedure. Pain relief was graded as excellent in 45 patients (19.7%), good in 48 patients (21%), fair in 45 patients (19.7%), and poor in 91 patients (39.7%). Cause of pain, conflict location, and pain intensity were not predictive factors of radicular pain relief, whereas the symptom duration before the procedure was highly correlated with the pain relief outcome. Patients with excellent results 2 weeks after the procedure had a mean duration of symptoms of 3.04 months (SD 3.28) versus 7.96 months (DS 9.04) in the group with poor pain relief. CONCLUSIONS: Periradicular infiltration is a simple, safe, and effective nonsurgical procedure that should be performed quite early in the course of the illness to provide radicular pain relief, because corticosteroid infiltration is less beneficial for patients with more chronic radicular pain. Lumbar radicular pain, a common entity in clinical practice, is frequently caused by disk herniation or degenerative changes in vertebrae. Various experimental studies have shown that this pain may occur as a result of mechanical compression and/or chemical radiculitis.1,2 Most patients recover with conservative care; as many as 90% of patients improve naturally after 1 year.3 To reduce this natural recovery time, numerous authors4–6 have proposed local delivery of corticosteroids and anesthetics to the affected nerve root. Various studies have demonstrated the therapeutic value of this strategy, but some authors achieved only a modest short-term reduction in leg pain. Lutz et al,7 in a study of 69 patients, reported a 70% pain decrease at the 1 week follow-up, whereas Ng et al,8 in a series of 43 patients, obtained only 26% global pain reduction, and 41.5% of patients had at least 20-mm reduction in leg pain as noted by the visual analog scale (VAS) scores. These disparities could be explained by numerous factors, including the procedure technique, evaluation patterns, and overall nonhomogeneity of patients selected in the studies. The purpose of our study was to identify predictive factors for clinical success or failure of periradicular infiltrations. Over a 2-year period, we prospectively followed 229 consecutive patients (average age, 55 years; range, 20–85 years; 52% men, 48% women) with lumbar radiculopathy for a minimal follow-up period of 1 year. Patients were recruited from the pain department of our institution, and all parameters were defined in this prospective clinical case series before the study. The inclusion criteria were as follows: (1) chief complaint primarily of leg pain that did not respond to at least 4 weeks of conservative treatment with a combination of an oral anti-inflammatory drug and an oral narcotic for severe pain, associated with physical therapy; (2) history, physical examination, and pain pattern consistent with lumbar radiculopathy; and (3) MR imaging or CT scan results, interpreted by a senior specialist, documenting disk herniation or degenerative disease with nerve root compression at the level and side of the clinical symptoms. The exclusion criteria were prior spinal surgery at the same level, progressive neurologic deficit, pregnancy, and no root compression demonstrated by CT scanning or MR. The radiculopathy level was L3 in 27 patients, L4 in 54 patients, L5 in 102 patients, and S1 in 46 patients. As determined by CT scanning or MR, the root compression was located on the posterolateral part of the disk in 114 patients, in the foramen in 100 patients, and was extraforaminal in 15 patients. The cause was disk herniation in 172 cases, degenerative stenosis as a result of disk bulging, hypertrophic osteoarthritis of the zygapophyseal joint, or posterior vertebral body osteophytes in 41 cases, and a combination of both in 16 cases. The main duration of radicular pain before infiltration was 6.3 months (range 1 to 42 months). All patients included in this study had undergone 1 year of clinical follow-up. Injections were performed at the level that best matched the patient’s clinical presentation. The technique was standardized in all procedures. Patients were placed in a prone position on a radiology table. Using a fluoroscope, a 22-gauge, 90-mm spinal needle was inserted under intermittent fluoroscopic guidance to the upper part of the foramina, at the suspected symptomatic radicular level. For L4 and L5 root injections, the needle was targeted to the corresponding transverse process. For the S1 root, the needle was inserted to the first sacral foramen. To confirm periradicular flow within the nerve root sleeve, we administered 1 or 2 mL of contrast (Omnipaque 240, Amersham Health, Princeton, NJ) (Fig 1). Once adequate flow of contrast to the target area of the dorsal root ganglion was documented, 2 mL of corticosteroid (80 mg of methylprednisolone acetate [Depo-Medrol]) and 3 mL of lidocaine (Xylocaine 2%) were slowly injected. After injection, patients were told to reduce their normal activity for the rest of the day. None of them received repeat injections. A, CT scan showing disk herniation in the posterolateral part of the L4-L5 disk. B, Transforaminal periradicular infiltration at the L5–S1 level, demonstrating the needle placement and contrast medium within the right L5 root sheet. During a rheumatologic consultation, the intensity of radicular pain was scored by the patient on the VAS, from 0 (no pain) to 10 (maximal intensity). Based on the pain score before the procedure, pain relief percentages 2 weeks and 1 year after infiltration were calculated and classified as “excellent ” when the pain was completely resolved or had diminished by 75% or more, “good ” for a diminution of 50% to 74%, “fair ” for a diminution of 25% to 49%, or “poor ” for a diminution of less than 25% or an increase in pain. Scores before and after the procedure were compared by using the Wilcoxon signed-rank test for paired values. To identify predictive factors of efficacy of the procedure, we tested the relationship between radicular pain relief categorized in 4 classes (excellent, good, fair, poor) and according to the following parameters: duration of symptoms before infiltration, intensity of pain according to the VAS score before infiltration by using the Kruskal Wallis test for these quantitative variables, cause of the disorder (ie, disk herniation or degenerative stenosis), and spinal level of radiculopathy by using the Fisher exact test for these qualitative variables. The mean VAS scores were 6.5 (range, 3.1–9.5) before and 4.2 (range, 0–9.5) 2 weeks after the procedure (35.4%), with significant pain relief (P < .001). 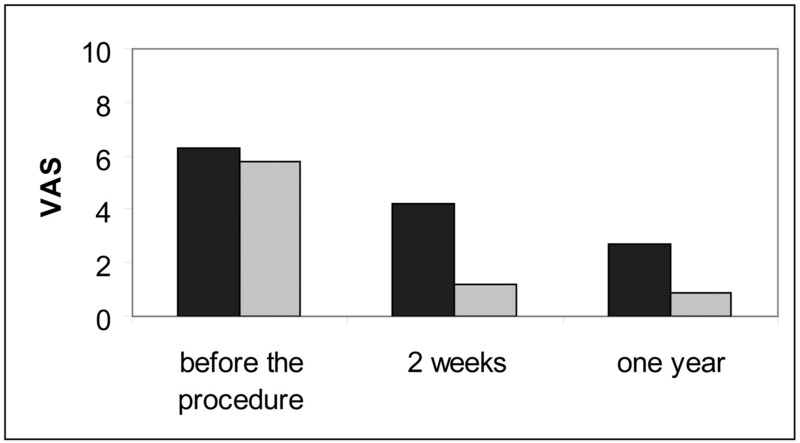 Two weeks after the procedure, pain relief was graded as excellent in 45 patients (19.7%) without any residual pain in 20 patients, good in 48 patients (21%), fair in 45 patients (19.7%), and poor in 91 patients (39.7%). No local complications occurred after the procedure in this series. Among the 93 patients with excellent or good pain relief 2 weeks after the procedure, the mean pain score dropped from 5.6 (SD 2.3) to 1.2 (SD 1.4), with a mean decrease of 4.4 (SD 1.6). In these patients, pain was scored after 1 year of follow-up and pain relief was classified as still good or excellent for 88% of the patients (whereas only 33% of the other patients had more than 50% pain relief at 1 year follow-up) (Fig 2). VAS of pain in the whole population (black) and in the population with good or excellent response (gray) at the 2 week follow-up, demonstrating that the benefit of the procedure persists. Duration of symptoms, cause of pain, conflict location, and VAS score before the procedure in the study population and in the 4 different groups, classified according to response to the procedure, are shown in the tables. The age of the patients, cause of pain, conflict location, and pain intensity graded by VAS were not predictive factors of radicular pain relief, whereas the symptom duration before the procedure was highly correlated with the pain relief outcome. Patients with excellent results 2 weeks after the procedure had a mean duration of symptoms of 3.04 months (SD 3.28) versus 7.96 months (DS 9.04) in the group with poor pain relief (Table 3). Lumbosacral radiculopathy is a common disease and a prevalent medical and socioeconomic problem.9 Most patients recover with conservative care, including bed rest, oral medication, lumbar corset, and physical therapy,3,10 but symptoms persist over several months in 10% of patients and eventually require surgery.11 Numerous local treatments have been proposed for these patients. Historically, epidural steroid injections have been used as an adjunct in the treatment of resistant radiculopathy.5,12,13 More recently, use of lumbar transforaminal injection to accurately deliver a high concentration of corticosteroid to the target site of the painful nerve root has demonstrated higher efficacy.14 Various studies have shown that local infiltration of anesthetic and corticoid can provide both short- and long-term pain relief. The pain-relief efficacy results for this technique are inconsistent in the literature. Lutz et al,7 in 69 patients with diskcal herniation, and Botwin et al15 in a degenerative stenosis population (34 patients) both reported a pain decrease of more than 70% according to VAS scores at the early follow-up (with around 75% successful long-term outcome for patients who had a pain reduction of at least 50% after a mean of 1.8 injections per patient). On the contrary, Ng et al,8 Lee et al,16 and Karppinen et al17 obtained only 35% to 45% leg pain improvement at the 2 week follow-up. These different results could be explained by differences in study design. The procedure can be performed under fluoroscopic7 or CT scan guidance,16 which could ensure accurate positioning of the needle tip, but no comparative study has demonstrated any superiority of CT scan guidance. One key feature of both techniques is that the injected contrast medium spreads peripherally around the nerve root and medially through the intervertebral foramen to the epidural space, thus certifying that the target area is reached. The evaluation procedures of the different studies are difficult to compare. Most of the authors assessed pain relief on the basis of the global intensity of pain decrease in their population,14,17 associated with standing tolerance, walking tolerance, and the Roland 5 point pain rating or satisfaction scale.8,15 Like Viton,18 we graded pain relief on the basis of the percentage pain decrease for each patient in 4 categories because we feel that this is the most accurate method for measuring pain patterns, which is why it is currently used to assess pain in cancer follow-up. We only included patients with demonstrated root compression because there is a risk of confusion about its level when the painful root is not clearly identified, and bad results can be secondary to corticoid injection at a wrong level. The foraminal infiltration efficacy differences in the published studies could be mainly explained by the inclusion criteria, which generated different patient populations regarding the age, pathology, and level of radiculopathy or pain duration before the procedure. Identifying the predictive factors for clinical success of periradicular infiltrations could ensure optimal selection of patients who would benefit most after this procedure. As in all the different studies, we noted no influence of patient age or radiculopathy level on the pain outcome. Controversial results have been reported on the efficacy of corticoid infiltration in patients with radicular pain secondary to disk herniation or foraminal stenosis. Lutz et al7 reported that patients with lateral recess stenosis respond less favorably than patients with disk herniation alone, and they are more likely to require surgical intervention to decompress the area of stenosis. On the other hand, Botwin et al,15 in 34 patients with radicular leg pain from degenerative lumbar stenosis, obtained a 75% successful long-term outcome, with at least 50% reduction between preinjection and postinjection pain scores. Riew et al19 reported a better outcome in terms of improvement of low back pain for a stenotic group compared with a lumbar disk herniation group at final follow-up. However, like Ng,8 we noted no statistical difference in the outcome of these 2 groups of patients. Several mechanisms could explain the efficacy of corticoids on radiculalgia in disk herniation as well as in degenerative conflict. The effect of mechanical compression caused by lumbar disk herniation and chemical irritation of the nerve root from leakage of disk materials is well documented in different studies.20,21 Various chemical mediators have been shown to induce pain. Chemotoxic pain mediators such as matrix metalloproteinase, c-fos, phospholipase A2, prostaglandin E2, and cytokines are present in abnormal quantities in disk herniation.3,22 A study by Roberts et al23 demonstrates that the more the disk is degenerated, the higher the affinity for staining of matrix metalloproteinases. In degenerative spine, there is usually intermittent compression of the nerve roots. This could lead to hyperhemia, venous congestion, and perhaps leakage of neurotoxic substances. In vitro studies simulating lumbar stenosis have shown that venous congestion, intraneural edema, and impaired axonal transport occur secondary to chronic compression.24,25 Corticosteroids are known to inhibit prostaglandin synthesis,26 impair both cell-mediated and humoral immune responses, stabilize cellular membranes, and block nociceptive C-fiber conduction.27–:30 Steroids also might inhibit the formation of nerve root edema. The rationale underlying the use of steroid infiltration is based on the results of studies that demonstrated abnormal concentrations of nociceptive and inflammatory mediators around lumbosacral disk lesions, leading to chemical neuroradiculitis in both herniation or degenerative disease. In the present study, the duration of symptoms before the procedure was the found to be best factor for predicting infiltration efficacy. This has already been noted by Ng et al, who achieved a modest reduction in VAS at 3 months’ follow-up in patients with chronic symptoms.8 In a very small group of 25 patients with disk herniation, Vad et al14 already reported the negative impact of a long pain duration of over 1 year in 2 patients on the outcome. In 69 patients with disk herniation, Lutz et al7 found that patients with a preinjection symptom duration of more than 24 weeks did not respond favorably (duration of less than 36 weeks with 78.8% success, whereas 64.7% success was obtained in 17 patients with a symptom duration of >36 weeks). Our results are in line with those of other studies. At the 2-week follow-up, we noted a mean 35% decrease in leg pain in a population of patients with 6.3 months of mean pain duration, whereas Karppinen17 reported 45% after 2.4 months of mean pain duration and Ng et al8 only 25% in more chronic patients (16.9 months). This could be explained by chronic compression resulting in microvascular injury, which can lead to nerve root ischemia, edema, and demyelinization.31 Irreversible neurophysiologic changes related to chronic inflammation, including irritation, may take place with chronic neural compression, perhaps rendering the nerve root refractory to management with the local administration of steroid. This suggests that in treating patients with radiculopathy we should be more cognizant and aggressive and implement these treatments earlier in the course of the illness, which could ultimately change patients’ long-term outcome. This study has several limitations. It was not compared with a control population and consequently a placebo effect could not be assessed. Most patients with radicular pain have significant spontaneous improvement over time and the improved results in patients with short duration pain may in fact partially represent natural improvement that may occur with time in this subgroup. The actual impact of this factor is unknown because there was no control population. It would have been interesting to conduct more assessments during the study year to assess a possible rebound effect, as suggested by Karppinen et al.17 However, the study was designed more to look for predictive factors of response to periradicular infiltration than to monitor this response. The main criticism is that it was a single-injection study (ie, multiple injections may produce a more sustained effect7,14), and it would have been interesting to know which population could have benefitted from a second or third infiltration in a short- and long-term follow-up. Further studies are now required to assess patient groups according to the cause of pain, its duration before the procedure, and the overall effect of the first infiltration. We conclude that periradicular infiltration is a simple, safe and effective nonsurgical procedure that should be performed quite early in the course of the illness to obtain radicular pain relief in both disk herniation and degenerative lesions because corticosteroid infiltration is less beneficial for patients with more chronic radicular pain. Bogduk N. Epidural steroids. Spine 1995;20:845–48. Tajima T, Furukawa K, Kuramochi E. Selective lumbosacral radiculography and block. Spine 1980;5:68–77. Accepted after revision October 3, 2005.